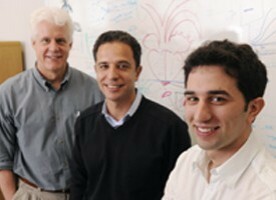 Researchers including (from left) Dr. Eric Olson, Dr. Hesham Sadek, and Dr. Enzo Porrello are investigating the fundamental mechanisms that control the heart’s natural regenerative on-off switch, a key step toward developing eventual therapies for damage suffered following a heart attack. Cardiologists and molecular biologists at UT Southwestern, teaming up to study in mice how heart tissue regenerates, found that microRNAs – tiny strands that regulate gene expression – contribute to the heart’s ability to regenerate up to one week after birth. Soon thereafter the heart loses the ability to regenerate. By determining the fundamental mechanisms that control the heart’s natural regenerative on-off switch, researchers have begun to better understand the No. 1 hurdle in cardiovascular research – the inability of the heart to regenerate following injury. “For the first time since we began studying how cells respond to a heart attack, we now believe it is possible to activate a program of endogenous regeneration,” said Dr. Hesham Sadek, assistant professor of internal medicine in the division of cardiology, and the senior author of a study in the Proceedings of the National Academy of Sciences. Each year, nearly 1 million people in the United States have a heart attack, while about 600,000 die of cardiovascular disease annually. Heart disease is the leading cause of death in both men and women, according to figures from the Centers for Disease Control and Prevention. As researchers worldwide strive to find ways that help the human heart cope with myriad illnesses and injuries, scientists at UT Southwestern have focused their attention on the heart’s regenerative capabilities. In 2011, a team led by Dr. Eric Olson, chairman of molecular biology, and Dr. Sadek demonstrated that within three weeks of removing 15 percent of the newborn mouse heart, the organ was able to completely grow back the lost tissue, and as a result looked and functioned normally. In the latest investigation, UTSW researchers found that hearts of young rodents mounted a robust regenerative response following myocardial infarction, but this restorative activity only occurs during the first week of life. They then discovered that a microRNA called miR-15 disables the regenerative capacity after one week, but when miR-15 is blocked, the regenerative process can be sustained much longer. Further research will be needed to optimize the ways in which medical scientists, and eventually clinicians, may be able to control this regenerative process. Other UT Southwestern investigators involved in the study are Dr. Beverly Rothermal, associate professor of internal medicine; Dr. Pradeep Mammen, assistant professor of internal medicine; Dr. Diana Canseco, postdoctoral researcher II of internal medicine; David Grinsfelder, research associate of internal medicine; and Brett Johnson, student research assistant of molecular biology. Former UTSW researchers involved are Dr. Ahmed Mahmoud, now at Harvard Medical Center; lead author Dr. Enzo Porrello, now at the University of Queensland in Australia; and Emma Simpson, research assistant in pathology. MiRagen Therapeutics, a biotechnology company co-founded by Dr. Olson and others, is working to develop a new class of microRNA-based therapeutics to enhance heart repair by modulation of miR-15 and other microRNAs. The study was funded by the National Institutes of Health, the American Heart Association, the National Heart Foundation of Australia, the Leducq Foundation, the Donald W. Reynolds Center for Clinical Cardiovascular Research, and the Robert A. Welch Foundation.